At TCM, we know that safety is paramount to your material handling operation. That's why our electric counterbalance forklift range has been specifically designed to ensure maximum visibility. Our Electric 3-4 Wheel Counterbalance truck features an integrated stability support system to ensure operator safety. Our trucks have also been fitted with new and improved overhead guards, which have been reprofiled to ensure the driver can get on and off the truck quickly and easily. In addition to this, the step used by operators to mount the truck is one of the lowest available on the market. This reduces the risk of operator injury at the beginning and end of their shift. 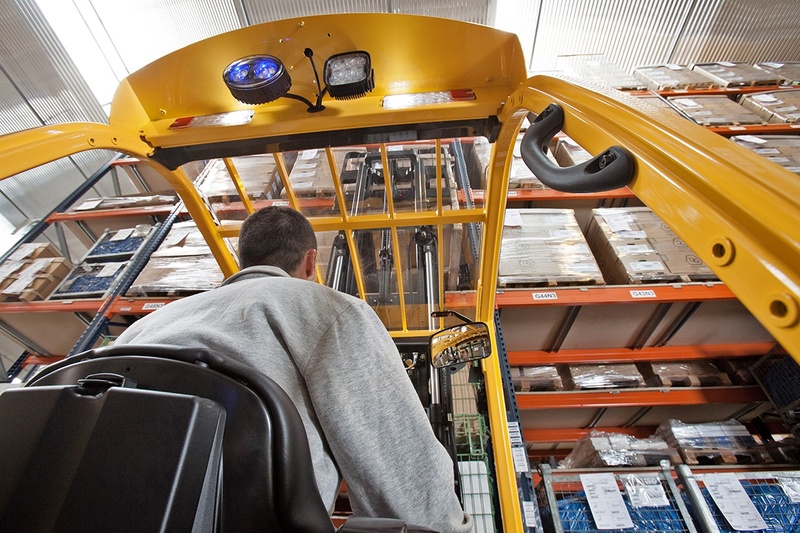 Visibility is crucial to preventing forklift accidents and ultimately ensuring a smooth and efficient operation. We have engineered our overhead guards to be strong enough to withstand heavy loads and protect the operator, while keeping bulkiness to a minimum to ensure everyone in the warehouse can see past it and identify any possible dangers. The design has been optimised for size, resulting in slim sections, and the roof has been maximised for visibility at all angles. The newly designed mast has also been engineered with greater visibility in mind. A unique feature of our electric counterbalance trucks is the front panel, which has been deliberately engineered to be lower. This ensures the operator can see in front of them fully, without obstruction. The trucks are also fitted with small windows to the side. These transparent panels enable operators to see to the bottom of the mast — where the forks are — without moving their head. This safety feature also helps to significantly reduce the risk of accidents. The FB Electric 3-4 Wheel Counterbalance truck’s stability support system includes a weight indicator, which compensates for the forklift speed and optimises stability in response to driver behaviour. Since it can identify how much weight is on the machine, if the load is making the truck unstable, it will limit the speed and acceleration. This feature enhances driver safety and lets the operator know when they should be taking extra care while driving. Looking for a material handling supplier that does more than just sell trucks? At TCM, we view truck sales as a long-term strategic partnership. As a result, we take a consultative approach to understand your operations, processes, and workforce, and bring in factors including servicing and maintenance to assess the total cost of ownership. Click the button below to enquire about our electric forklift truck range today and start your journey towards a more cost-effective, efficient, and environmentally friendly future.